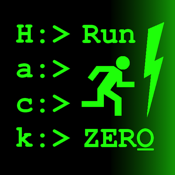 Note: 'Hack RUN 2 - Hack ZERO HD' is a prequel to the app 'Hack RUN'. You should play 'Hack RUN' before starting this game. Test your skills again as you hack your way through strange and secretive organizations to discover their hidden agendas! Hack ZERO HD uses old school prompts (like dos and unix) to help you navigate from system to system. As you access users' accounts, you'll discover more and more about the organizations and the people that work there. The iPad 'HD' version contains additional features not found in the standard iPhone game such as functional 'command' windows that can be resized and moved around the terminal. Make sure to play the THIRD, FOURTH and FIFTH games called 'Hack Time HD', 'Hack NET HD' and 'Hack WATCH' after you complete this game! 'Hack RUN 2 - Hack ZERO HD' is a game. It is not a tool or aid for learning how to hack into real computer systems. i273, LLC does not endorse hacking.